, born at Ventimiglia, in the republic 01 Genoa, 1607, was a man of great reputation in the learned world, and wrote several books. At fifteen years of age he entered into the order of the Augustins, where he became so much esteemed, that he was appointed vicar-general of the congregation of our Lady of Consolation at Genoa. As soon as he had finished his studies, he taught philosophy, which he continued to do for five years; after which he travelled into several parts of Italy, and settled at Venice in 1639, in the convent of St. Stephen. 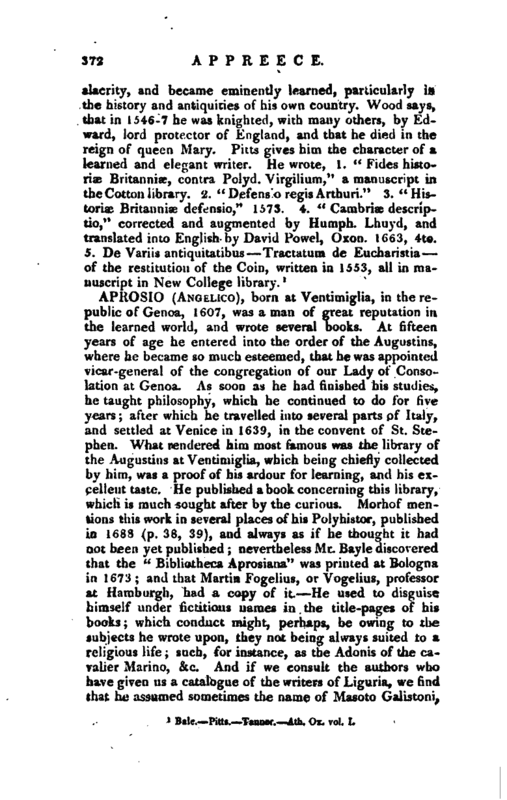 What rendered him most famous was the library of the Augustins at Ventimiglia, which being chiefly collected by him, was a proof of his ardour for learning, and his excellent taste. He published a book concerning this Jibrary, which is much sought after by the curious. Alorhof mentions this work in several places of his Polyhistor, published in 1688 (p. 38, 39), and always as if he thought it had not been yet published; nevertheless Mr. Bayle discovered that the “Bibliotheca Aprosiana” was printed at Bologna in 1673; and that Martin Fogelius, or Vogelius, professor at Hamburgh, had a copy of it. 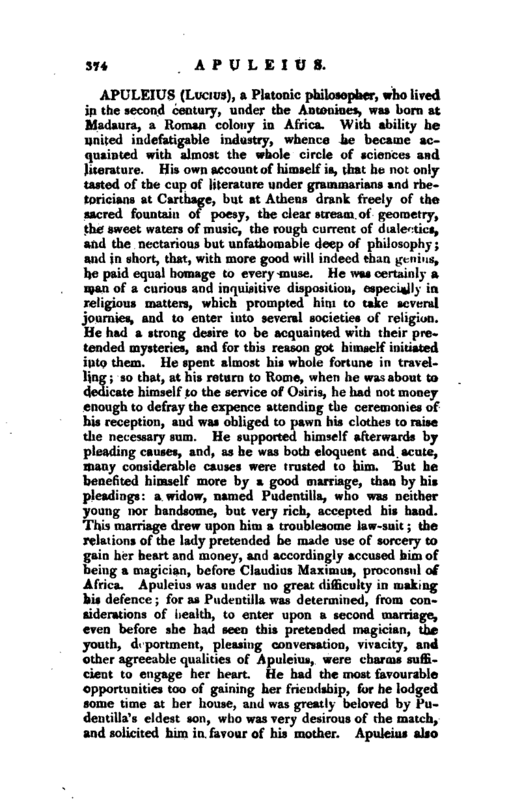 He used to disguise himself under fictitious names in the title-pages of iiis books; which conduct might, perhaps, be owing to the subjects he wrote upon, they not being always strited to a religious life; such, for instance, as the Adonis of the cavalier Marino, &c. And if we consult the authors who have given us a catalogue of the writers of Liguria, we find that he assumed sometimes the name of Masoto Galistoni, | sometimes that bf Carlo Galistoni, Scipio Glareano, Sapricio Saprici, Oldauro Scioppio, &c. The cavalier Stigiiani having published the book of “l’Oehiale,” or the Spectacles, which is a severe censure on the “Adonis,” he was attacked on all sides; but amongst all the advocates for cavalier Marino, nobody shewed more zeal for the Adonis than Aprosio: the pieces he wrote in defence of it came abroad with the following tides: “Ochiali stritolato di Scipio Glareano per risposta al Signer Cavaiiere Fra Toinaso Stigiiani;” The Spectacles broken, by Scipio Glariano, being an Answer to signor cavalier Fra Tomaso Stigiiani. 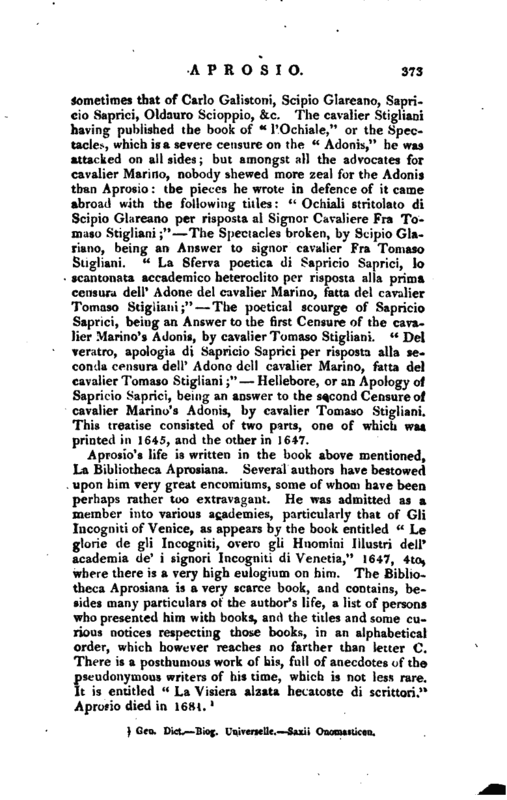 “La Sferva poetica di Sapricio Saprici, lo scantonata accademico heteroclito per risposta alia prima censura dell‘ Adone del cavalier Marino, fatta del cavalier Tomaso Stigliani;” The poetical scourge of Sapricio Saprici, being an Answer to the first Censure of the cavalier Marino’s Adonis, by cavalier Tomaso Stigiiani. “Del veratro, apologia di Sapricio Saprici per risposta alia seconda censura dell’ Adone dell caval.er Marino, fatta del cavalier Tomaso Stigiiani;” Hellebore, or an Apology of Sapricio Saprici, being an answer to the second Censure of cavalier Marino’s Adonis, by cavalier Tomaso Stigiiani. This treatise consisted of two p-ms, one of which was printed in 1645, and the other in 1647. Gen. Dict. Biog. Universelle. —Saxii Onomasticon.